Me: Hey Arnold. How's California? Arnold: Screw California. I've got bigger things on my mind. I have some questions for you. I have heard rumors that there is no dark matter, that it all can be explained by MOND. That would be good, right, we could kill off this dark matter stuff? Me: Well, some people think so. Arnold: Well why don't you just run a simulation with that big fancy computer of yours? It should be child's play -- shouldn't it be just a one line change to your force law? Me: Well, it's not that simple. Arnold: Do it now! NOW! Me: OK, let me explain why it's complicated. N-body simulations represent mass by individual particles, right? Me: And we get the force on a particle by summing up the Newtonian forces from all the other particles, right? Me: Well the standard representation of MOND acceleration as the geometric mean of the Newtonian acceleration and the MOND characteristic acceleration means that accelerations doesn't add correctly. Me: OK, let's look at it this way. We'll take a particle with mass 4M and calculate the Newtonian acceleration a test particle at distance r would feel. Arnold: Yes, I remember that from my freshman physics class. Me: Good! OK, now lets break that particle up into 4 smaller particles each of mass M.
Arnold: I will break that puny particle with my superstrong muscles. Arnold: It looks like two crossed barbells. I must lift them. Me: No Arnold, leave them alone. Now we again calculate the Newtonian acceleration of the test particle. Arnold: Yah. of course, how silly of me. 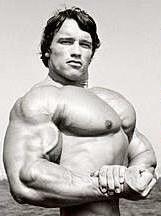 Arnold: You mean like my biceps expand? Me: Maybe it's a tumor? Arnold: IT'S NOT A TUMOR! Me: OK, just checking. Anyway, we can simplify this with algebra. You remember algebra? Arnold: Shut up! - no one likes a smartass. See, Arnold? We get the same answer. Arnold: Hey, very cool, there! You computational astrophysicists are pretty smart people for punyboys. Arnold: That's a lot of math, there. I do not like so much math. Do not anger me, punyboy, or I will smash your grandmother into millions of tiny pieces! Arnold: Can we break up that particle now? I wish to break things. Arnold: This math looks messy. I don't like this. Arnold: That can't be right. Maria, get the car. We're leaving. which is twice the original MOND acceleration. Arnold: Mihos, you punyboy, explain it to me. Why is that a problem? Me: Our "breaking up the particle" experiment is equivalent to running a simulation with larger particle number -- i.e., we have more particles of lower mass to represent the mass. But you've just seen that while that works under Newtonian gravity, it doesn't work in this representation of MOND. The accelerations change as you change the particle numbers. Arnold: So you mean MOND is wrong? Arnold: This sounds too hard for me. I will go solve California's budget problems instead. Good luck, Mihos. Me: Good luck yourself, Arnold. And so off Arnold went. But questions like his don't go away -- his curiosity will eventually get the best of him, and he'll be back. Yessiree, I'm sure of it -- he'll be back.